It has become fashionable for agri-food commentators to talk of disruptive change. In particular, in recent months there has been much talk about industry disruption that will supposedly occur from synthetic food, with much of that grown in a laboratory. Until now, I have steered clear of discussing synthetic food, despite often being asked my opinion. But now, I have decided to venture forth. The simple answer is that synthetic food does not need to be a big concern for New Zealand farmers. The important proviso is that New Zealand farmers, and the associated value chains connecting through to markets, need to focus on consumers who will pay premium prices for products that are the ‘real McCoy’. . .
“The Upper Clutha Farmers Group are becoming increasingly concerned about the drain Contact Energy is having on the Hawea Flat water supply. Lake Hawea’ s water level follows a seasonal cycle which is controlled by Contact Energy to provide electricity supply when demand is at its peak. The Group’s concern stems from Contact’s move to lower operating levels in lake Hawea to generate more electricity. Traditionally spring is when the lake’s level is at its lowest, however the current level is the lowest since monitoring began. The farming community believe with Contact change of operating levels it is having a far greater effect on the ground water flows through the aquafers in the Hawea Flat region. . .
Westland Milk Products has recovered from a loss in the 12 months ended July 31, 2016, to post a break-even profit before tax for the 2016-17 financial year. The company, New Zealand’s second largest dairy co-operative, said the result represented a total payout to its 342 shareholders of $338.7million, a net average cash payout of $5.18/kgms. . . Rapid change in the food sector could mean eight out of the top 10 global food companies out of business in the next decade, a researcher says. The Te Hono Stanford University Bootcamp is a week-long intensive programme and this year the focus was how to accelerate New Zealand’s food production in the global marketplace. Plant and Food Research chief operating officer Bruce Campbell said the message from the US was clear. “There’s quite significant disruption coming for the food sector. . .
Scientists are investigating the potential for a new commercial crop of a “super” hybrid blueberry. Plant & Food Research is trying to breed a fruit that combines the taste and growing characteristics of blueberries with the colourful flesh of bilberries. Bilberries are a small berry from Northern Europe with dark blue-red flesh, but with a thin skin they’re too delicate to grow commercially because the fruit is easily damaged in transit. . . The environment, water quality and urban perception of farming is more important than it’s ever been, says 2017 Canterbury Ballance Farm Environment Awards finalist Lyndon Matthews. “This election has been polarised around water quality. My belief is farmers are doing great stuff but we’re not so good at telling our story. That’s one of the reasons these awards are so important – telling the stories. “Personally we’ve always been happy to put ourselves up for scrutiny. If it’s a good story we want to share it and if it’s not, we want to learn. Some people are worried about putting their head above the parapet but farmers have to be prepared to open ourselves to scrutiny. More farmers need to show what they’re doing.” . . The South Canterbury farmer whose property was first identified as infected with Mycoplasma bovis now fears the disease might also be present further north. Glenavy farmer Aad van Leeuwen’s comments come after the Ministry for Primary Industries (MPI) announced yesterday the cattle disease was present in Otago. It had been hoped the outbreak, first detected on Mr van Leeuwen’s Bennetts Rd farm on July 22, and then on his nearby Dog Kennel Rd farm on July 31, was confined to the South Canterbury area. MPI said blood test results from a farm in the Oamaru area – known to have had a ”direct connection” with the Bennetts Rd farm prior to its current lockdown – showed ”some animals have been infected with the disease”. . .
Information on nutrient losses from the Foundation for Arable Research’s (Far) flux-meter data-collection project will have applications for Otago and Southland arable farmers. ”Protecting our groundwater: measuring and managing diffuse nutrient losses from cropping systems” project from the Ministry for the Environment’s Freshwater Improvement Fund. The $1million project has been under way for three years in partnership with HortNZ, Ravensdown, five regional councils and Plant and Food Research. The balance of funding comes from industry and regional council partners. . .
Zespri reported to around 500 grower-shareholders today at its Annual Meeting on a record 2016/17 season, with global sales up 19 percent from last season to $2.26 billion on the back of exceptionally high yields. Zespri Chairman Peter McBride explains the high yields and late start to the New Zealand season meant lower per-tray returns for Zespri Green but continued strong per-hectare returns for the Green business. . .
“There’s a lot of information out there about things like getting meals and the kids ready for calving season but not a lot about getting your body ready,” says Nicole, a mother of two young boys. “Women are often involved in calf rearing and it’s really hard physical work. Women are often busy juggling kids and work so it’s hard for them sometimes to stay active and find time to work on their fitness . . .
Napier-based farming expert Barrie Ridler has some answers for farmers struggling to curb their nitrogen leaching. Dairy farmers, especially in the Tararua District, are waiting to see how Horizons Regional Council reacts to the Environment Court’s April declarations – but are already under pressure to reduce the nitrogen they leach. Mr Ridler says matching stock numbers to pasture growth is the secret, and keeping the two in balance will limit greenhouse gas emissions. . .
A former Inglewood High School student is among the first recipients of a Silver Fern Farms Pasture to Plate Youth Scholarship. 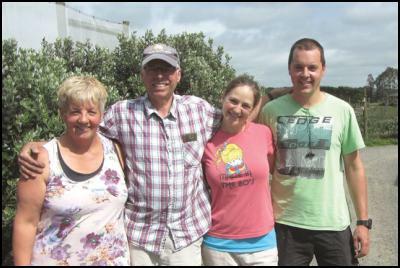 Jake Jarman, who grew up on a central Taranaki dairy farm, will receive $5000 to help further his career in farming. The scholarships are aimed at helping young people develop their careers in the red meat, food and farming industries and SFF chief executive Dean Hamilton said the talent emerging from applications indicated a bright future for the broader red meat sector. . .
I’m a farmer. I don’t stop when I’m tired, I stop when I”m done. The amalgamation/monolith structure of Fonterra was a mistake. But it is what we have and pulling it to bits now could compound the mistake. The Fonterra monopoly came from a conjunction of dairy politics with the instincts of a leftist Clarke Cabinet, at a time when they needed to rebuild trust with business. The Fonterra ‘capture the value chain’ slogans appealed to a Cabinet nurtured on coop=good/big battalions/commanding heights socialism. So they legislatively outflanked the Commerce Commission, relegated official reservations, and created the monolith. The Herald has an excellent review of the reasoning and the outcomes by Tony Baldwin, an official at key times. But his recommendations could be used to support those who’d like now to pull levers the other way, and impose new structures, equally well meant, equally sloganistic, and equally without knowing the future any more reliably. . . Created in 2001, Fonterra was heralded as a ‘breakthrough idea’ meant to help New Zealand ‘catch the knowledge wave’. 14 years on, there’s been no economic transformation, writes Tony Baldwin. “Potentially better than an oil well,” boasted Fonterra’s founding chairman, John Roadley, in 2002. “White gold” is another favourite label. Over many decades, New Zealand has invested massively in raw milk as a pathway to economic prosperity. It’s why Fonterra was formed. . . .
(BusinessDesk) – Landcorp Farming, which is taking on debt to convert former forestry land into dairy farms, won’t pay a dividend this year, highlighting the friction between the state-owned farmer’s long-term strategy and the government’s demand for regular payments in preference to investment. New Zealand’s largest corporate farmer posted an 84 percent decline in annual profit to $4.9 million, in line with its forecast of $1 million to $6 million, as revenue fell 12 percent to $213.5 million on weak milk and lamb prices. Debt rose 25 percent to $222 million, mostly to fund dairy conversions on the 26,000 hectare Wairakei Estate north of Taupo, slated to become the biggest milk producer in the southern hemisphere. Landcorp is 12 years into a 40-year lease to operate and develop the estate. . . Entering the 2015 Ballance Farm Environment Awards (BFEA) proved a thoroughly enjoyable experience for Northland farmers Ian and Sandy Page. The Pages own Tahere Farm near Whangarei in the Pataua North district. Previously a run-down unit, the couple has spent many years developing the 162ha farm into a model of sustainability. With the whole title area under QEII National Trust covenant, BFEA judges said Tahere was like a privately owned regional park, farmed in the public interest. Tahere has about 62ha of indigenous forest. Another 59ha runs sheep and beef and the balance is in production forestry. . .
A team developing a nutraceutical that could help regulate blood glucose levels thereby support the treatment of type II diabetes has won the University’s 2015 Proof of Concept grant. The $50,000 grant, offered by the University’s commercialisation arm, Otago Innovation, is aimed at transforming novel research at Otago into a marketable idea, product or service. Dr Phil Heyward and Dr Alex Tups of the Department of Physiology are working on the nutraceutical, which involves a plant product. They are collaborating with Associate Professor Nigel Perry of Plant and Food Research and Pat Silcock, the Manager of Food Science’s Product Development Research Centre, who each bring essential expertise to the project. . . Some of the country’s best viticulturists and vineyards have been recognised for their grape growing skills. The Bragato wine awards were announced in Hawke’s Bay last night as part of the New Zealand Winegrowers Romeo Bragato conference. A Villa Maria chardonnay, with grapes grown by Brett Donaldson, won the Bragato Trophy. And a Villa Maria cabernet sauvignon merlot, made from grapes grown by Phil Holden in Hawke’s Bay, won the champion domaine wine. Chair of the judges, Ben Glover, said the competition recognises the grape growing behind a top drop. . .
A night of nerves, skill and finesse surrounded the all-female finalists of the inaugural Tonnellerie de Mercurey 2015 New Zealand Young Winemaker competition last night. Hawke’s Bay Winemaker, Lauren Swift took the inaugural title after she battled it out following three days of winemaking challenges at the Romeo Bragato conference. Lauren says, “It was an extremely tough competition, I’m really thrilled with the result. It’s been such a great opportunity for me, and has already opened a number of doors and given me so much confidence. . . .
A bee scientist says the appearance of a new honey bee parasite is the last thing beekeepers need, with the most serious pest, the varroa mite, becoming more difficult to control. The gut parasite, Lotmaria Passim, has been found in beehives on Coromandel Peninsula and in the southern North Island. Plant and Food Research bee unit head Mark Goodwin said the discovery had serious implications for the bee industry, because it and another parasite, Nosema Ceranae, also present in New Zealand, have been linked with bee colony collapses overseas. . . Regional New Zealand has seen the downturn coming for some time, but in the main cities the realisation is only starting to dawn. . . Dairy prices will pick up, it’s just a matter of when and how quickly they do, Finance Minister Bill English says. Dairy product prices sank again in last week’s GlobalDairyTrade auction, with whole milk powder leading the way with a 13.1 percent drop. “The way it’s been described to me is there’s been a perfect storm of excess milk supply influenced by events in Russia, Europe and China and in New Zealand and Australia and that’s led to these prices,” Mr English told reporters. . .
(BusinessDesk) – Disgruntled Alliance Group shareholders have gathered sufficient support to force a special meeting to discuss the potential benefits and risks of a merger with fellow cooperative Silver Fern Farms. Balfour farmer Jeff Grant, who along with rural accountant and farmer, Gaye Cowie, have been gathering the required 5 percent of proxy forms needed to force the special meeting, say they have sent 7 percent to the company for verification. The move matches a similar one by Silver Fern Farms shareholders to force a special meeting within their own meat cooperative. . .
A six-month police investigation led to two arrests yesterday in connection with several incidents of alleged poaching in Central and South Otago. About 20 police, including the armed offenders squad and Alexandra and Omakau officers, carried out a search of an Ida Valley property yesterday morning and seized ammunition, two 4WD vehicles and a quad bike, Sergeant Derek Ealson, ofAlexandra, said. Following the search, a 27-year-old man and 28-year-old woman, both of Central Otago, were charged with 12 offences relating to unlawful hunting, trespass, unlawful possession of firearms and possession of cannabis, he said. . .
Stud sheep breeding is in Ben Sutherland’s blood. Mr Sutherland (19), who comes from Benmore Station, near Omarama, has inherited a long standing family interest in and passion for farming. His great grandfather, H. J. Andrew, farmed Punchbowl, near Maheno, with well known Southdown and Poll Dorset sheep studs, while his grandfather, Jim Sutherland, founded the Benmore merino stud. . .
Owners of a lodge near Arthurs Pass have become so fed up with one of their lambs they sent out an online plea for someone to take the animal off their hands. The animal enjoys hanging out with humans a little bit too much, and it’s driving the owners crazy. Grasmere Lodge owner Thomas Butler says ‘Marcus’ has a taste for the finer things in life, and he’s getting too cosy with the luxury alpine lodge they call home. He follows them everywhere, chews on the plants, poops on the doorstep and regularly jumps into the car for a ride. . .
At a special BFEA ceremony on April 23, the de Jong’s family-run business, Southern Belle Orchard, also collected the Hill Laboratories Harvest Award, the Massey University Innovation Award, the WaterForce Integrated Management Award and the Ballance Agri-Nutrients Soil Management Award. . .
Bee scientists have been left baffled by the disappearance of thousands of honey bees from hives last spring, and say unless it happens again, it remains a mystery as to what caused it. Plant and Food research bee scientist Mark Goodwin said last October a number of bee keepers from around the country began reporting strange symptoms occurring in their hives. He said bees usually rebuilt their colonies in spring after winter, however, large numbers of bees were disappearing from hives in the Coromandel, Raglan and Wairarapa areas. “So instead of having a queen and a lot of brood – that’s larvae and pupa – and about 30 or 40,000 bees, when the bee keeper came back a few weeks later … suddenly there were no bees there at all, there was a queen and about a hand full of bees and everybody else had gone. And we saw that in whole apiaries and between apiaries and then we were getting reports from beekeepers elsewhere in the North Island that were noticing very similar things.” . .
You’ve probably seen this advertised. You might remember the law was changed in 2013 to allow Anzac day and Waitangi day to be moved to a Monday if they fall on a weekend. This year’s Anzac day will be the first affected – but what does Mondayising really mean for you as a rural employer? In reality for most farm staff – not much. Another round of farmer events is under way nationally to give dairy farmers a ”wake-up call” to assess their cash-flow situation, given the low milk price forecasts. DairyNZ, which is behind the Tactics for Tight Times campaign, has analysed what it is like for the average farmer in every dairying region and it is ”not looking pretty”, chief executive Tim Mackle says. While 2015-16 would probably still end up being a break-even year for most farmers, he said cash flow would be a major issue that could result in some increased term debt in the sector and less spending in the regions. . .
Three of New Zealand’s most well known companies: Fonterra, Deloitte and The Warehouse were last night crowned “Good Business Eggs” in recognition of their work in the community sector. Whilst these companies might be better known for the scale of their business activities, they also demonstrate significant commitments to their various community initiatives. The event hosted by CQ Hotels Wellington, one of last years winners was packed with business and community leaders anxious to see who had won the annual award. . .
Fonterra Co-operative Group Limited today announced changes to the roles and responsibilities of two members of the Fonterra Management Team. Chief Executive Theo Spierings today said: “In her new role, Jacqueline will lead the next stage in Fonterra’s evolution, working across the entire Co-operative to push forward the Velocity part of our V3 strategy and deliver the best possible performance.” . . ADOPTION of the ‘True Aussie’ brand for all agricultural produce would be “a little perplexing”, says Australian Made campaign marketing manager Ben Lazzaro. The National Farmers’ Federation (NFF) and Meat and Livestock Australia (MLA) plan to build standards for MLA’s True Aussie brand – developed last year for red meat – which can then be applied to all Australian agricultural products in domestic and global markets. While the existing government-backed Australian Made label covers a broad range of products including electronics, furniture and clothing as well as food, True Aussie would be “all about agriculture”, an NFF spokeswoman said. . . Bureaucracy gone mad "@theweeklytimes Farmer could be charged with "publishing pornographic images" for hay bale art http://t.co/fhsZEp5BqO"